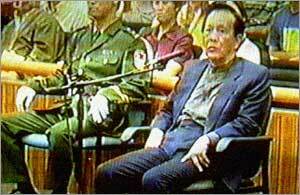 Ten years ago today, former Chinese politburo member Cheng Kejie was executed for gobbling up an impressive $5 million in bribes. The onetime chairman of the Guangxi Zhuang Autonomous Region was (and, as best I can determine, remains) the highest-ranking official judicially executed since the Communists took power in China in 1949. He’d spent the best part of the 1990s soaking up kickbacks from his powerful post, much of it secreted in out-of-country accounts. The execution was part of a massive campaign against official corruption which has long bedeviled China’s economic surge. Cheng’s own former boss around this time warned that “graft could destroy China”. Cheng’s execution was announced after the fact, at the same time that China belatedly publicized the arrest of former Vice-Minister of Public Security Li Jizhou in a billion-dollar smuggling scandal. Li somehow managed to duck execution for similarly show-stopping corruption allegations (including scandalous details supplied by his mistress*), a fact which raised eyebrows in the People’s Republic about improper influence. ** He “deserves to die ten thousand times over,” opined the Beijing Youth Daily. Here in 2010, China (whose wholesale execution pace is quietly on the decline) has moved — not without opposition — to drop the death penalty for a number of non-violent economic crimes. That rollback apparently would not apply to bribery, however. * Cheng’s case also featured the salacious “other woman” hook, which often rounds out modern-day tales of official malfeasance. Cheng and his bit on the side “conspired to amass wealth for their planned marriage after divorcing their spouses”; Cheng’s lover, however, turned state’s evidence on him. She wound up with a life sentence. ** Li had some serious political weight to throw around; his father had helped prosecute the Gang of Four after the Cultural Revolution.